The ties between the Canaries and the Mediterranean world which had existed since antiquity were interrupted by the decline and fall of the Western Roman Empire. Although these linkages were weakened, they were not totally severed, and the Canaries' isolation was not total. During the Middle Ages, the first reports on the Canaries come from Arabic sources, which refer to some Atlantic islands which may have been the Canaries. What does seem clear is that this knowledge of the islands did not signify the end of the cultural isolation of the native inhabitants. The economic expansion of some European states, such as the Republic of Genoa, the Kingdom of Aragon, the Kingdom of Castille, and the Kingdom of Portugal. Maritime trade along the Moroccan coast was a 'fait accompli' for all of these nations. Development of new navigation techniques (compass, astrolabe, stern rudder, cog-caravel) and the development of cartography: a portulan map by Angelino Dulcert of Majorca, from 1339, is the first to show some of the Canary Islands, and this date might in fact coincide with the effective rediscovery of the islands by the Genoese seaman Lanzarotto Malocello. The first expedition to visit all the islands of the archipelago took place two years later, in 1341, under the command of fellow Genoese seaman and explorer Niccoloso da Recco, at the service and on behalf of Portuguese king Afonso IV. Ideological and political motives: the monarchies of Southern Europe entered an expansive phase. In the case of the Iberian monarchies, their territorial expansion was spurred by the so-called reconquista ("reconquest") of Moorish southern Spain (al-Andalus). For this reason, territorial expansion represented a reinforcement of royal power, imbued with crusader and missionary spirit. The first visit by a European to the Canary Islands since antiquity was by Genoese captain Lanceloto Malocello traditionally dated 1312 (but possibly a little later, between 1318–1325). Malocello's motives were unclear - it is believed he might have been searching for traces of the Vivaldi brothers who had disappeared off Morocco, around Cape Non back in 1291. Malocello made landfall (possibly shipwrecked) on Lanzarote island, and remained there for nearly twenty years. Malocello may have attempted to erect himself as a ruler among the aboriginal peoples and been eventually expelled by them. According to some sources, shortly after his return to Europe, in 1336, Malocello led a return expedition to the Canaries, sponsored by the Portuguese crown. However, the existence of this expedition has been dismissed by most modern historians, as being based on later forged documents. Evidently drawing from the information provided by Malocello, in 1339 appeared the portolan map by Angelino Dulcert of Majorca showing the Canary island of Lanzarote (named Insula de Lanzarotus Marocelus and marked by a Genoese shield), as well as the island of Forte Vetura (Fuerteventura) and Vegi Mari (Lobos). Although earlier maps had shown fantastical depictions of the "Fortunate Islands" (on the basis of their mention in Pliny), this is the first European map where the actual Canary islands make a solid appearance (although Dulcert also includes some fantastic islands himself, notably Saint Brendan's Island, and three islands he names Primaria, Capraria and Canaria). European interest in the Canaries picked up quickly after the 1341 mapping expedition. The descriptions of the primeval Guanches, in particular, drew the attention of European merchants, who immediately saw the prospect of new and easy slave-raiding grounds. In 1342, two Majorcan expeditions, one under Francesc Duvalers, another under Domenech Gual, assembled by private merchant consortia with a commission from Roger de Robenach (representative of James III of Majorca) set out for the Canary islands. The results of these expeditions are uncertain. The Catholic Church was also drawn by the news. In 1344, the Castilian-French noble Luis de la Cerda (Count of Clermont and Admiral of France), then serving as a French ambassador to the papal court in Avignon, submitted a proposal to Pope Clement VI, offering the Church the more palatable vision of conquering the islands and converting the native Canarians to Christianity. In November 1344, Pope Clement VI issued the bull Tuae devotionis sinceritas granting the Canary islands in perpetuity to Luis de la Cerda and bestowing upon him the title of sovereign "Prince of Fortuna". The pope followed this up with another bull, in January 1345, giving the projected Cerda-led conquest and conversion of the islands the character of a crusade, granting indulgences to its participants, and papal letters were dispatched to the Iberian monarchs urging them to provide material assistance to Cerda's expedition. The Portuguese king Afonso IV immediately lodged a protest, claiming priority of discovery, but conceded to the authority of the pope. Alfonso XI of Castile also protested, claiming that, by the ancient Visigothic dioceses and prior reconquista treaties, the islands fell within the Castilian jurisdiction and 'sphere of conquest', but nonetheless recognized Cerda's title. Despite their formal concessions, preparations were stalled by the opposition of the Iberian monarchs, with the result that no expedition was mounted before Cerda's death in 1348. With De la Cerda out of the picture, other parties resumed their adventures and we have notices of further expeditions by Majorcans (now annexed by Aragon) to the area - Jaume Ferrer in 1346 (aiming for Senegal, but might have touched the Canaries), Arnau Roger in 1352, and a royal-sponsored expedition by Joan Mora in 1366 (with instructions to also patrol for interlopers). These expeditions (and doubtless many other unrecorded ones, not only by Majorcans, but also likely by merchants of Seville and Lisbon) were almost wholly commercial, with the primary purpose of capturing native islanders to sell as slaves in European markets. But there was also some peaceful trade with the locals, particularly for orchil and dragon's blood, which grew wildly on the islands and were much valued as dyes by the European cloth industry. The pope did not give up on his hope of converting the natives. In 1351, Pope Clement VI endorsed an expedition by Majorcan captains Joan Doria and Jaume Segarra, with the object of bringing Franciscan missionaries, including twelve converted Canarian natives (apparently seized by previous Majorcan expeditions), to the islands. Whether this expedition ever set out is uncertain. Apocryphal legend relates the missionaries succeeded established an evangelizing center at Telde (on Gran Canaria), which the pope elevated to the 'Diocese of Fortuna' (although no bull to that effect has been found), until they were expelled in a native uprising in 1354. More confidently is the bull issued in July 1369 by the Avignon Pope Urban V erecting the diocese of Fortuna and appointing Fr. Bonnant Tari as bishop, and a follow-up bull of September 1369 instructing the bishops of Barcelona and Tortosa to dispatch 10 secular and 20 regular clergy to preach to the Canarians in their native languages. But whether this actually set out or just remained a paper project is also uncertain. We have a more reliable record of a Majorcan expedition in 1386 carried out by 'Pauperes Heremite', sponsored by Peter IV Aragon and Pope Urban VI. Although their exact fate is unknown, there is a later report that thirteen "Christian friars" who had been preaching in the Canaries "for seven years" were massacred in an uprising during 1391. At least five missionary expeditions would be sent (or at least planned) between 1352 and 1386. Geographic knowledge of the Canary islands coalesced with these expeditions. La Gomera and El Hierro are depicted in the 1367 portolan of the brothers Domenico and Francesco Pizzigano. The Catalan Atlas of 1375 shows the Canaries almost completely and accurately mapped (only La Palma is missing). The eleven islands are named in the Catalan Atlas (from east to west) as Graciosa (La Graciosa),laregranza (Alegranza), rocho (Roque), Insula de lanzaroto maloxelo (Lanzarote), insula de li vegi marin (Lobos), forteventura (Fuerteventura), Insula de Canaria (Gran Canaria), Insula del infernio (Tenerife), insula de gomera (La Gomera), insula de lo fero (El Hierro). The name 'tenerefiz' is first given alongside 'Infierno' in the 1385 Libro del Conoscimiento. During the 1370s, when Portugal and Castile were engaged in dynastic wars following the assassination of Peter I of Castile, Portuguese and Castilian privateers were dispatched against each other, several of which made detours to the Canary islands for shelter or slave-raiding jaunts. Ignoring the 1344 bull, Ferdinand I of Portugal granted (in 1370) the islands of Lanzarote and La Gomera to the adventurer 'Lançarote da Franquia' (believed by some to be none other than the impossibly-aged Lanceloto Malocello). This Lanzarote made an attempt to seize the islands and is reported to have engaged in fighting with "Guanches and Castilians" there. (1) A 1360 wildcat Catalan-Majorcan expedition of two ships, captain unknown (alleged in legend to be the same Aragonese galleys prepared for Cerda back in 1344). Upon making landfall at La Gomera or Gran Canaria, the Europeans were defeated and taken prisoner by the native Canarians. After a certain period of time living among the Canarians (possibly a few years), the native chieftains secretly decided to kill all the prisoners. The entire crew, including the clerics (two Franciscan friars according to Abreu de Galindo, five says Viera y Clavijo), were swiftly rounded up and massacred by the Canarians. (2) a 1372 expedition by 'Fernando de Castro' (Galician, not his Portuguese namesake), who also made landing at La Gomera. After engaging in hostilities, Castro was defeated by the natives, but (unlike the 1360 expedition), the surviving Europeans were magnanimously spared and allowed to embark back to Iberia. Tradition claims that at the behest of the local king Amalahuige, Castro (or Oromel later) left behind his chaplain to convert his people to Christianity. (3) the famous tale of the Biscayan privateer Martín Ruiz de Avendaño, who took shelter on Lanzarote in 1377, and, during his stay, slept with the queen Fayna, wife of native king Zonzamas. This liaison produced a daughter Ico, who went on to marry the next king Guanarame and produce a son, Guardafia. After Guanarame's death, Guardafia's ascension to the throne was blocked by suspicions that his mother Ico (Avendaño's daughter) was not of noble lineage, until she was put through a trial by ordeal (being smoked in hut, and survived). (4) A 1382 ship from Seville, commanded by Francisco Lopez, wrecked off Guinigada (Gran Canaria), with 13 survivors; they went on to live among the Canarian natives, until their deaths c.1394. (5) An expedition in 1385 by Hernan Peraza, a Sevillan with a permit from Henry III of Castile. (6) A 1386 expedition of two ships, under the command of Fernando de Ormel, of Galician origin, but noble in Castile and naval officer of John I of Castile. While patrolling the Andalusian coast, was caught up in a storm and ended up emerging at La Gomera. (7) A 1399 expedition of Gonzalo Peraza Martel, Lord of Almonastor (unlike the actual voyage of Almonastor in 1393). Other legendary traditions include the apparition of the Virgin of Candelaria in 1392-93, encountered by two Guanches on the beaches of Tenerife. In the 14th century, a variety of forces competed for control of the Canaries: Genoese, Catalan-Mallorcan, Castilian, and Portuguese. In the following century, Castile and Portugal were the primary contenders. The conquest took place between 1402 and 1496. It was not an easy task, militarily, given the resistance of the Guanche aboriginals in some islands. Nor was it easy politically, given the conflicting interests of the nobility (bent on fortifying their economic and political power) and the state, particularly Castile, with an interest in reinforcing its own power in competition with the nobles. Conquista señorial, so called because the conquest was carried out by the nobility for their own ends and without the direct participation of the Crown. Under a pact of vassalage the Crown granted the rights to the conquest and in exchange the noblemen swore allegiance to the Crown. We can distinguish within this period two phases. The first is known as the Conquista Betancuriana o Normanda (the Bethencourt or Norman Conquest) was carried out by Jean de Bethencourt and Gadifer de la Salle between 1402 and 1405 and involved the subjugation of Lanzarote, El Hierro and Fuerteventura. The second phase is known as the Conquista Señorial castellana and was carried out by Castilian nobles whose appropriation of the land was mediated through purchase, cession and marriage. This phase included the land conquered in the first phase and also the island of La Gomera and lasted until 1450. Conquista realenga. This term defines the conquest carried out directly by the Kingdom of Castile during the reign of the Catholic Monarchs who armed and part financed the conquest of the islands not yet subjugated: Gran Canaria, La Palma and Tenerife. This conquest ended in 1496 with the defeat of Tenerife and the integration of the Canaries Archipelago into the Kingdom of Castile. The Conquista realenga took place between 1478 and 1496. The first period of the conquest of the Canaries was carried out by the Norman nobles Jean de Bethencourt and Gadifer de la Salle. Their motives were basically economic: Bethencourt possessed textile factories and dye works and the Canaries offered a source of dyes such as the orchil lichen. Bethencourt received important political support in the court of King Henry III of Castile. His uncle, Robert de Braquemont, gained the king's permission for the conquest of the Canary Islands on behalf of the Norman noble. In exchange for these rights Bethencourt became a vassal of the Castilian King. Robert de Braquemont invested a significant amount in the venture. The story of the Bethencourt Conquest was recorded in the chronicle known as the Canarien, compiled by two clerics Pierre Bontier and Jean Le Verrier. The original was adapted in two later versions, one by Gadifer de La Salle (which appears the more reliable of the two) and the other by the nephew of Bethencourt, Maciot de Bethencourt. The Norman expedition set off from La Rochelle and stopped off in Galicia and Cádiz before arriving in Lanzarote in the summer of 1402. The island's aborigines and their chief Guadarfia were unable to resist the invading forces and surrendered. The Normans established themselves on the south of the island where they constructed a fortress and founded the Bishopric of Rubicon. From this location they attempted an assault on Fuerteventura. This campaign lasted between 1402 and 1405. The extended duration was not due so much to the resistance of the islanders as to the difficulties and internal divisions between the two captains leading the invaders. Hunger and a lack of resources forced the expedition to retreat to Lanzarote. Jean de Bethencourt then travelled to Castila to drum up further support. There King Enrique III supplied the necessary measures and the confirmation of Bethencourt's exclusive rights to conquer the island, thereby marginalising Gadifer. During Bethencourt's absence Gadifer had to confront a double rebellion, one by a section of his men led by Bertín de Berneval, who had restarted the capture of slaves and the other by the Lanzarote guanches who resisted this practice. Pacifying the island took until 1404 and the conquest of Fuerteventura recommenced at the end of that year. However, the two commanders acted separately, each one fortifying his own domain (the castles of Rico Roque and Valtarajal). The conquest of the island was completed in 1405 with the surrender of the native kings of the island. On an unknown date Gadifer abandoned the island and returned to France to defend his rights, but he would never return to the islands. After the victory Bethencourt, absolute owner of the islands, returned to Normandy in search of settlers and new resources in order to continue the conquest of the rest of the islands. The conquest of El Hierro took place in 1405. There was no resistance offered by the scattered Guanche population who were largely sold as slaves. The island was then repopulated with Norman and Castilian settlers. Bethencourt remained on the islands until 1412 when he returned permanently to his lands in Normandy, leaving Maciot de Bethencourt in charge of his possessions. The Bethencourt era ended in 1418 when Maciot sold his holdings and the rights to subjugate the remaining islands to Enrique Pérez de Guzmán. From this point on the intervention of the King of Castile increased. Between 1418 and 1445 dominion over the islands changed hands on a number of occasions. Finally, control over the conquered islands and the right to further conquests fell to Hernán Peraza The Elder and his children Guillén Peraza and Inés Peraza. The death of Guillén Peraza in the attack on La Palma has been immortalized in a moving lament. After the death of her brother Inés and her husband Diego García de Herrera became the sole rulers of the islands until 1477 when they ceded La Gomera to their son Hernán Peraza The Younger and the rights to the conquest of La Palma, Gran Canaria and Tenerife to the King of Castile. The island of La Gomera was not taken in battle but was incorporated into the Peraza-Herrera fiefdom through an agreement between Hernán Peraza The Elder and some of the insular aboriginal groups who accepted the rule of the Castilian. However, there were a number of uprisings by the guanches due to outrages committed by the rulers on the native Gomeros. The last one, in 1488 caused the death of the islands ruler, Hernán Peraza, whose widow, Beatriz de Bobadilla y Ossorio, had to seek the assistance of Pedro de Vera, conqueror of Gran Canaria, in order to snuff out the rebellion. The subsequent repression caused the death of two hundred rebels and many others were sold into slavery in the Spanish markets. The Catholic Monarchs commanded and armed the invading forces. The funding for the enterprise was the responsibility of the Crown and individuals interested in the economic exploitation of the island's resources. The islands involved, Gran Canaria, La Palma and Tenerife, had larger populations and offered the best economic rewards. The guanches of the three islands, but particularly those of Gran Canaria and Tenerife, offered a clear and prolonged resistance to the conquest. a) Initial stage, June – December 1478. The first expeditionary force disembarked on La Isleta on 24 June 1478. The force was commanded by Juan Rejón and Dean Bermúdez, as representative of the Bishop of San Marcial del Rubicón, Juan de Frías, who was a co-financier of the expedition. They founded Real de La Palmas near to Barranco de Guiniguada on the site of the present day Las Palmas de Gran Canaria. A few days later the first battle of the campaign took place near to Real when the islanders were defeated. This initial victory gave the Castilians control of the north east corner of the island. b) Guanche resistance and Castilian divisions from the close of 1478 until 1481. This period is defined by aboriginal resistance in the mountainous interior, the lack of men and materials and internal disputes between the invaders. During this stage Juan Rejón was dismissed on the orders of the Catholic Monarchs. His place was taken by Pedro Fernández de Algaba who was subsequently executed by order of the deposed Rejón. The naming of Pedro de Vera as the new governor of the island and the arrest of Juan Rejón put an end to the in-fighting that had continued until 1481.
c) Suppression of the guanche resistance and conquest of the island, 1481–83. Pedro de Vera, now undisputed commander of the Castilian forces, resumed the conquest of the island's interior and the guanche fiefdom of Gáldar. He was able to do this because a large contingent of reinforcements had been sent from Gomero by Diego García de Herrera. The guanche leader Doramas was subsequently killed in the Battle of Arucas. The capture of Tenesor Semidán, king of Gáldar, by Alonso Fernández de Lugo was a decisive factor in the victory of the invaders. Tenesor Semidán was sent to Castile where he was baptized with the name Fernando Guanarteme and after signing the Calatayud Pact with Fernando the Catholic he became a loyal and valuable ally of the Castilians. His actions have been interpreted in a number of ways throughout history: some think he was a traitor to the aboriginal cause; while others feel he was an able negotiator who saved many lives. On 29 April 1483 Guayarmina Semidán, considered to be queen of Gran Canaria, surrendered at Ansite Fortress. On the same day Chief Bentejuí and his shaman-advisor Faycán committed suicide by jumping off a cliff while shouting Atis Tirma (for my land). Alonso Fernández de Lugo, who played an important role in the conquest of Gran Canaria was granted the rights of conquest for La Palma and Tenerife by the Catholic Monarchs. The agreement with the Crown included a fifth of the captives and 700,000 maravedís if the conquest was completed within a year. In order to finance the enterprise Alonso Fernández de Lugo entered into association with Juanoto Berardi and Francisco de Riberol. Each partner contributed a third of the costs and would receive the same proportion of the benefits. The campaign was relatively easy, commencing on 29 September 1492 when the Castilians landed in Tazacorte. 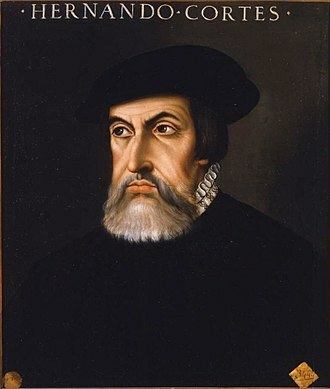 Alonso Fernández de Lugo made use of agreements and pacts with the guanches which respected the rights of the chieftains giving full equality with the Castillians in order to attract them to his cause. Resistance was generally minimal, with the exception of an incident in Tigalate. However, there was more concerted resistance in the canton of Aceró (Caldera de Taburiente) where the chief, Tanausú, was easily able to hold out as the only two access points to the area were readily defendable against the advance of the invading forces. Seeing that the year would soon be up and fearing that he would lose the bonus of 700,000 maravedíes Fernández de Lugo proposed a meeting with Tanausú which was to take place in Los Llanos de Aridane. The Castilians ambushed and captured Tanausú when he left the Caldera. He was then sent to Castile as a prisoner, however, he starved to death on the journey. The official date for the end of the conquest is given as 3 May 1493. Following this part of the population of Aceró and other cantons which had signed peace treaties were sold as slaves although the majority were integrated into the new society formed after the conquest. Tenerife was the last island to be conquered and the one that took the longest time to submit to the Castilian troops. Although the traditional dates of conquest of Tenerife are established between 1494 (landing of Alonso Fernández de Lugo) and 1496 (conquest of the island), it must be taken into account that the attempts to annex the island of Tenerife to the Crown of Castile date back at least to 1464. For this reason, from the first attempt to conquer the island in 1464, until it is finally conquered in 1496, 32 years pass. In 1464, takes place in the barranco del Bufadero taking symbolic possession of the island by the Lord of the Canary Islas Diego Garcia de Herrera. 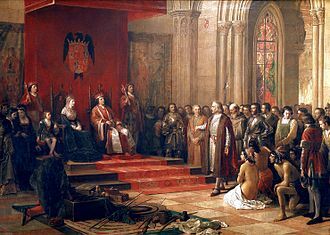 This signing a peace treaty with menceyes, allowing shortly after mencey Anaga build a tower on their land, where Guanches and Europeans had treatment until it is demolished around 1472 by the same Guanches. In 1492 the governor of Gran Canaria Francisco Maldonado organizes a raid ending in disaster for Europe, as they are defeated by the Guanches of Anaga. In December 1493 Alonso Fernández de Lugo obtained the Catholic Monarchs confirmation of his right of conquest over the island of Tenerife and in exchange for renouncing the bonus promised for the conquest of La Palma he claimed governorship of the island, although he would not receive revenue from the quinto real tax. The finance for the conquest was achieved by the sale of his sugar plantations in the valley of Agaete, obtained after the conquest of Gran Canaria, and by forming an association with Italian merchants who had settled in Seville. At the time of the conquest Tenerife was divided into nine Menceyatos or kingdoms which can be divided into two camps, one largely in favour of the Castilians and the other opposed to them. The former which became known in Spanish as ″el bando de paz″, comprised the peoples of the south and east of the island (from the ″menceyatos″ of Anaga, Güímar, Abone and Adeje) who had previous contact with Castilians through the activities of the missionary Candelaria. The opposing ″bando de guerra″ was based in the ″menceyatos″ of the north: Tegueste, Tacoronte, Taoro, Icoden and Daute and maintained a fierce resistance to the invasion. The invading force set sail from Gran Canaria in April 1494 and landed on the coast of present-day Santa Cruz de Tenerife. The force comprised 2,000-foot soldiers and 200 cavalry made up of peninsular Castilians as well as soldiers from the other Canary Islands (mainly from Gomera and Gran Canary). After building a fortress they advanced towards the interior of the island. They tried to negotiate with Bencomo, the most important king in the ″bando de guerra″, and offered peace if he accepted Christianity and submitted to the authority of the Catholic Monarchs. Bencomo rejected the conditions attached to the offer making confrontation inevitable. The first armed encounter between the two sides was the celebrated First Battle of Acentejo that took place in a ravine called the Barranco de Acentejo or Barranco de San Antonio in the present day municipality of La Matanza de Acentejo. A force of more than 2,000 men advanced towards the north of the island through the valley of Taoro. The objective was to defeat the Guanches in the centre of their heartland. The guanches ambushed the invaders who suffered a grave defeat, losing eighty percent of their forces in the battle. Alonso Fernández de Lugo managed to escape to Gran Canaria where he organized a new force with better trained troops and greater financial resources supported by Genoese merchants and Castilian nobles. After the battle the guanches destroyed the fortress built by the Castilians. With a better trained and armed force Alonso Fernández de Lugo returned to Tenerife. After rebuilding the fortress at Añazo he advanced towards the plains of Aguere (San Cristóbal de La Laguna) where in November he defeated Bencomo in the Battle of Aguere as the gaunche leader committed the error of engaging the Castillian forces in battle in open ground. The use of cavalry and reinforcements provided by Fernando Guanarteme were the deciding factors in the Castillian victory. The guanches lost 1,700 men including Bencomo and his brother (or possibly stepbrother) Tinguaro. It is claimed that an epidemic had infected the population before the battle, decimating the island's population and leaving the survivors weak or ill, this is known as the "gran modorra" or the great drowsiness. However, the exact size of the epidemic and its importance in the outcome of the battle remains disputed by some historians. In December 1495, after a long period of guerrilla warfare, pillaging and war fatigue the Castilians again advanced on the interior in the direction of Taoro, this time from the north. A force of several thousand guanches awaited them in a ravine near to the present day municipality of La Victoria de Acentejo, not far from the site of the First Battle of Acentejo. The Castilian victory in the Second Battle of Acentejo brought about the collapse of aboriginal resistance and access to the Taoro Valley remained open. The battle marked the conquest of the island of Tenerife and the end of the conquest of the Canary Islands. ^ The case for this expedition has been principally made by Charles Verlinden, "Lanzarotto Malocello et la découverte portugaise des Canaries", Revue Belge de philologie et d'histoire, 36 (1958), pp. 1173-1209. For a review of the dispute, see Diffie and Winius (p.25). ^ For the reply of Alfonso XI (Mar 1345) see MH, vol. 1 p.234. See also Meliá (p.45). ^ Ferdinand I's grant of Nossa Senhora a Franca (Lanzarote) and Gomeira (La Gomera) (June 1370) is reproduced in MH, vol.1 p.244. The hypothesis that 'Lançarote da Franquia' was the elderly Lanceloto Malocello is principally due to Verlinden (1958). But this would make Malocello's at least a nonagenarian. To reconcile the age, Verlinden disputes the authenticity of the 1312 expedition, claiming that Malocello was never marooned on Lanzarote 'for two decades', that Malocello's first trip to the Canaries was in fact the leading the murky Portuguese expedition of 1336. Another hypothesized identity for Lancerote de Framqua is Lançarote Pessanha, admiral of Portugal. ^ The attempt is recorded in Ferdinand I's letter of 1376, MH, vol. 1,p.250. A later letter dated 1385 (MH, v.1, p.262) notes that 'Lançarote da Franquia' died in the Canaries and his titles were inherited by his son 'Lopo Affonso da Franquia', suggesting the Portuguese claimant might have succeeded in establishing some sort of presence there. ^ Story originally from Fr. Juan de Abreu Galindo. Reported in Viera y Clavijo (p.191-92). The story is suspect principally on account of the dates - Guardafia was an adult when he met Bethencourt in 1403, making it unlikely he could have been the grandson stemming from Avendaño's visit in 1377. The trial by ordeal involved an element of human sacrifice (frequently reported in Guanche culture): Ico was placed in a sealed hut with three common village women, and fires were set and the smoke pumped into it; the determination that she was of noble blood was assessed by the fact that the three commoners suffocated to death, whereas Ico survived. Her survival is credited to an old woman who secretly gave her a wet sponge to place over her mouth. ^ a b Rumeu de Armas, Antonio (1975). 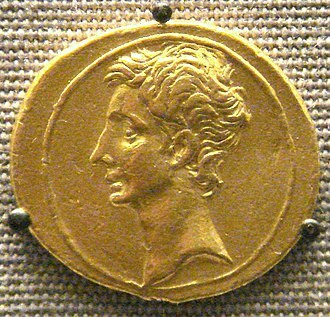 "VI-XIII-XV". La Conquista de Tenerife (1494-1496) (1st ed.). Aula de Cultura de Tenerife. pp. 155–171, 291–294, 350–354. ISBN 84-500-7108-9. Bonnet y Reverón, B. (1945) "Las expediciones a las Canarias en el siglo XIV" Revista de Indias, Vol. 6. Reprinted 1946 Las expediciones a las Canarias en el siglo XIV, Consejo Superior de Investigaciones Científicas. Fernández-Armesto, F. (2007) Before Columbus: exploration and colonisation from the Mediterranean to the Atlantic 1229-1492. Philadelphia: University of Pennsylvania Press. Jiménez de la Romera, W. (1868) Crónica de las Islas Canarias. Madrid: Rubio, Grily y Vitturi. Russell, P.E. (2000) Prince Henry 'the Navigator': a life New Haven, Conn: Yale University Press. Verlinden, C. (1958) "Lanzarotto Malocello et la découverte portugaise des Canaries", Revue Belge de philologie et d'histoire, Vol. 36, p. 1173-1209. The Portuguese territories of Colonia do Sacramento and Rio Grande do Sul were conquered by the Spaniards. 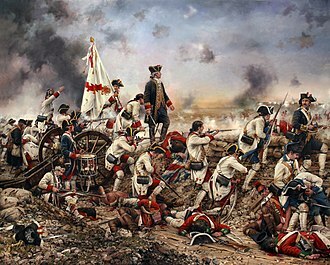 The Anglo-Portuguese forces were defeated and forced to surrender and retreat, the Colonia do Sacramento and the near territories were under Spanish control until the Treaty of Paris, while Rio Grande do Sul would be reconquered by Portugal a few years later. This expedition was the only Spanish victory in a chain of heavy Spanish defeats at the hands of the British. In January 1762, Spain joined France against Great Britain in the Seven Years War, the plan was to attack Portugal, which had been neutral up to then, but which was an important economical ally of Great Britain. He started preparations and in September 1762 he had assembled enough men, the fleet sailed across the Rio de la Plata, and disembarked on September 14. It was an army of almost 4,000 men. The siege of the city started on October 5, the relations between Cevallos, who commanded the army, and Sarria, who commanded the fleet, were very bad. After disembarking the army and without approval of Cevallos, Sarria sailed his fleet of 16 ships back to Buenos Aires, luckily for the Spanish, the Portuguese were ill prepared, and on October 31,1762, Vicente da Silva, the governor of the city, capitulated. The biggest ship was HMS Kingston which was renamed Lord Clive, the small squadron, under the command of Robert MacDouall left Lisbon on August 30 and was joined in Rio de Janeiro by two Portuguese warships transporting 500 foot soldiers, and five storeships. On January 6,1763, MacDouall decided to attack and retake Colonia do Sacramento in Spanish hands, the HMS Lord Clive, the HMS Ambuscade and the Portuguese Gloria anchored near the city and started bombardment, but they received unexpected strong resistance from the city gun battery. After three hours of fire exchange, a fire erupted on the Lord Clive, it extended and ships santabarbara blew up. There were 272 fatalities on board, including the expeditions commander Captain Robert MacDouall, HMS Ambuscade and Gloria were badly damaged too, and retired from combat. The Bolivian war of independence began in 1809 with the establishment of government juntas in Sucre and La Paz, after the Chuquisaca Revolution and La Paz revolution. These Juntas were defeated shortly after, and the fell again under Spanish control. The May Revolution of 1810 ousted the viceroy in Buenos Aires, Buenos Aires sent three military campaigns to the Charcas, headed by Juan José Castelli, Manuel Belgrano and José Rondeau, but the royalists ultimately prevailed over each one. 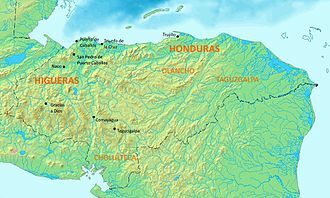 However, the conflict grew into a war, the War of the Republiquetas. Bolivian independence was proclaimed on August 6 of 1825, Charcas is sometimes referred to as the Upper Peru. This region fell under the authority of Spanish colonial rule in the sixteenth century and this governing was composed of oidores or judges and a governor with the title of president of the Audiencia. 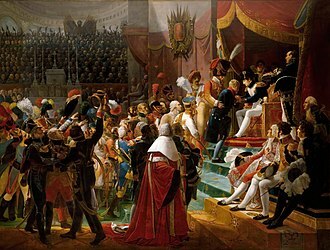 The Audiencia was given authority to make decisions when a viceroy was unavailable or absent. The Audiencia was centered in Chuquisaca, which started out as a community and became known by its post-independence name. This was the center of administration as well as activities for Charcas. The Archbishop of Charcas lived there and one of the prominent universities in Bolivia, was founded there, the Audiencia was a great honor for the Charcas. Oidores mostly came directly from Spain and tended to be very proud and they were incredibly ignorant about the peoples needs and problems. As Spanish settlements expanded to the south, the jurisdiction of the Audiencia of Charcas grew to not only present day Bolivia. In 1776, the Audiencia of Charcas was placed under the authority of the viceroy of Buenos Aires in the newly created Viceroyalty of the Río de la Plata and most trade was redirected to Buenos Aires. This change was against Peruvian desires because they had wanted to keep Charcas for its enormous wealth in the mines of Potosí, for the next few decades, the question of the political and economic ties with Charcas was constantly fought over by Peru and Río de la Plata. On May 25,1809 the citizens of Sucre participated in the first outbreak that was part of the initiation of the war of independence in Bolivia, in 1784 the Spanish rulers created the intendancy system. The Battle of Djerba took place in May 1560 near the island of Djerba, Tunisia. 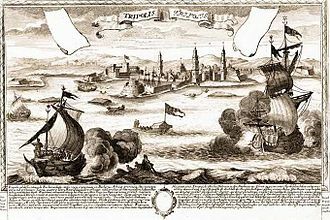 The Ottomans under Piyale Pashas command overwhelmed a large joint Christian Alliance fleet, composed chiefly of Spanish, Maltese, the allies lost 27 galleys and some smaller vessels as well as the fortified island of Djerba. This victory marked perhaps the point of Ottoman power in the Mediterranean Sea. Until about 1573 the Mediterranean headed the list of Spanish priorities under Philip II of Spain, under his leadership the Habsburg galley fleet increased to about 100 ships, and more in wartime. Spain sent a fleet against the Turks in 1560, aiming for the island of Djerba off the coast west of Tripoli. The Ottoman fleet won a victory, killing more than 10,000 men. However, typically of the aftermath of Mediterranean battles, they did not follow up the victory, Spain was able to rebuild its fleet in the next two years and prepared a new offensive in 1563-64 with nearly 100 ships. Despite the Ottomans being victorious in the battle, they were unable to attack the Venetian center of gravity, indeed, by 1558 Piyale Pasha had captured the Balearic Islands and together with Turgut Reis raided the Mediterranean coasts of Spain. The historian William H. Prescott wrote that the sources describing the Djerba campaign were so contradictory it was impossible to reconcile them. Most historians believe that the fleet assembled by the allied Christian powers in 1560 consisted of between 50 and 60 galleys and between 40 and 60 smaller craft, for example, Giacomo Bosio, the official historian of the Knights of St John writes that there were 54 galleys. Fernand Braudel gives 54 warships plus 36 supply vessels, one of the most detailed accounts is by Carmel Testa who evidently has access to the archives of the Knights of St. John. He lists precisely 54 galleys,7 brigs,17 frigates,2 galleons,28 merchant vessels and 12 small ships and these were supplied by a coalition that consisted of Genoa, the Grand Duchy of Tuscany, the Papal States, and the Knights of S. John. Matthew Carr gives the number of 200 ships for the Christian Alliance, the joint fleet was assembled at Messina under the command of Giovanni Andrea Doria, nephew of the Genoese admiral Andrea Doria. The Conquest of Tunis in 1535 was an attack on Tunis, under the control of the Ottoman Empire, by the Habsburg Empire of Charles V and its allies. In 1533, Suleiman the Magnificent ordered Hayreddin Barbarossa, whom he had summoned from Algiers, altogether 70 galleys were built during the winter of 1533–1534, manned by slave oarsmen, including 2,000 Jewish ones. Barbarossa thus established a naval base in Tunis, which could be used for raids in the region. The expense involved for Charles V was considerable, and at 1,000,000 ducats was on par with the cost of Charles campaign against Suleiman on the Danube. Despite a request by Charles V, Francis I denied French support to the expedition, Francis I was under negotiations with Suleiman the Magnificent for a combined attack on Charles V, following the 1534 Ottoman embassy to France. Francis I only agreed to Pope Paul IIIs request that no fight between Christians occur during the time of the expedition. 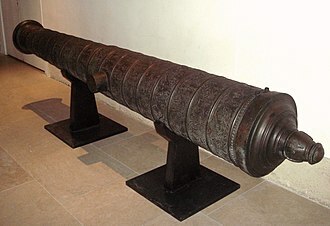 On 1 June 1535, protected by a Genoese fleet, Charles V destroyed Barbarossas fleet and, after a costly yet successful siege at La Goletta, in the ruins, the Spanish found cannonballs with the French Fleur-de-lys mark, evidence of the contacts stemming from the Franco-Ottoman alliance. The resulting massacre of the city left an estimated 30,000 dead, Barbarossa managed to flee to Algiers with a troop of several thousand Turks. Muley Hasan was restored to his throne, the stench of the corpses was such that Charles V soon left Tunis and moved his camp to Radès. Furthermore, he was Holy Roman Emperor and had de jure control over much of Germany as well, Ottoman defeat in Tunis motivated the Ottoman Empire to enter into a formal alliance with France against the Habsburg Empire. Ambassador Jean de La Forêt was sent to Constantinople, and for the first time was able to become permanent ambassador at the Ottoman court, Charles V celebrated a neo-classical triumph over the infidel at Rome on April 5,1536 in commemoration of his victory at Tunis. He Spanish governor of La Goulette, Luys Peres Varga, built fortified the island of Chikly in the lake of Tunis to strengthen the defences between 1546 and 1550. Barbarossa managed to escape to the harbour of Bône, where a fleet was waiting for him, from there, he sailed to accomplish the Sack of Mahon, where he took 6,000 slaves and brought them to Algiers. Because of this the viceroy often had the support of the Lima oligarchy, who saw their elite interests threatened by popular rebellion and were opposed to the new commercial class in Buenos Aires. 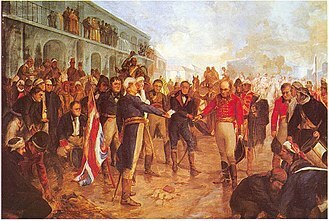 During the first decade 1800s Peru had been a stronghold for royalists, among the most important events during the war was the proclamation of independence of Peru by José de San Martín on July 28,1821. During the Peninsular War central authority in the Spanish Empire was lost, after success of the royalist armies, Abascal annexed Upper Peru to the viceroyalty, which benefited the Lima merchants as trade from the silver-rich region was now directed to the Pacific. Because of this, Peru remained strongly royalist and participated in the reforms implemented by the Cádiz Cortes. Peru was represented at the first session of the Cortes by seven deputies, Peru became the second to last redoubt of the Spanish Monarchy in South America, after Upper Peru. Peru eventually succumbed to patriot armies after the continental campaigns of José de San Martín. Some of the early Spanish conquistadors that explored Peru made the first attempts for independence from the Spanish crown and they tried to liberate themselves from the Viceroyalty, who governed for the king of Castile. Throughout the eighteenth century, there were several uprisings against colonial rule. Some of these uprisings became true rebellions and it is debated whether these movements should be considered as precedents of the emancipation that was led by chiefs, Peruvian towns, and other countries in the American continent. The independence of Peru was an important chapter in the Hispano-American wars of independence, the campaign of Sucre in Upper Peru concluded in April 1825, and in November of the same year Mexico obtained the surrender of the Spanish bastion of San Juan de Ulúa in North America. The Spanish strongholds in Callao and Chiloé in South America fell in January 1826, Spain renounced all their continental American territories ten years in 1836 leaving very little of its vast empire intact. Despite the royalist tendencies of Peru, junta movements did emerge, there were two short-lived uprisings in the southern city of Tacna in 1811 and 1813. One significant movement, led by Natives in Huánuco, began on February 22,1812 and it involved various leaders, including curacas and township magistrates, but was suppressed within a few weeks. More enduring was the rebellion of Cuzco from 1814 to 1815, the rebellion began in a confrontation between the Constitutional Cabildo and the Audiencia of Cuzco over the administration of the city. Cabildo officials and their allies were arrested by the Audiencia, Criollo leaders appealed to retired brigadier Mateo Pumacahua, who was curaca of Chinchero, and decades earlier had been instrumental in suppressing the rebellion of Túpac Amaru II. Pumacahua joined the Criollo leaders in forming a junta on August 3 in Cuzco, in 1814, the first expedition was successful in reconquering Chile after winning the Battle of Rancagua. In 1817 following the royalist defeat in the Battle of Chacabuco, initially it was successful in the Second Battle of Cancha Rayada, the expedition was finally defeated by José de San Martín in the Battle of Maipú. Portrait of Don Santiago de Liniers. Naval Museum of Madrid. Sir William Beresford, commander of the British troops. Lieutenant-General John Whitelocke, commander of the British forces in the second invasion. 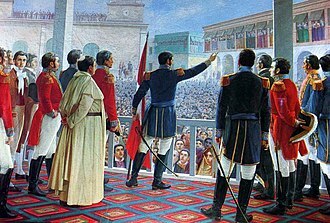 San Martín proclaims the independence of Peru. Oil painting by Juan Lepiani. 100 years of struggle for independence: 25 de Mayo de 1809 on a commemorative stamp. Portrait of Alejandro O'Reilly by Francisco de Goya. Portrait of Sir John Acton, attributed to Emanuele Napoli. Portrait of Captain Melgarejo. The ships in the background on the left are Lord Clive, in the moment she was blown up by the fire of the Spanish coastal batteries, and the damaged Ambuscade.